Our office does not use a CO2 laser for skin resurfacing. Though the results are dramatic for this type of resurfacing, the downtime is much too long and painful. If I would not have it done to me, then I will not do it on a patient. 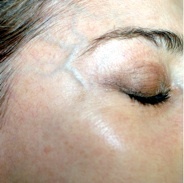 We use a microlaser peel (Pixel). It is an intra-epidermal laser peel that precisely ablates the outer most layers of the skin. The procedure is individually tailored to the nature of the condition to be corrected. Skin conditions such as wrinkles, acne scars, keratosis, and pigmentary problems can be successfully treated with a Microlaser peel. Generally Microdermabrasion only removes the stratum corneum (1st layer – 10 microns). Our Microlaser peel is a partial to full epidermal peel (20-50 microns). It is generally done without topical anesthesia, however topical or I.V sedation can be done for the procedure. For maximum results the microlaser peels are usually stacked to receive maximum benefit. You can expect smoother, healthier, more vibrant skin, with significant immediate change in skin texture and tightness. However we often combine the two treatment modalities for a greater ablation of the skin. Healing takes 3-4 days, with the symptoms resembling sunburn. Minor sloughing will occur on the second day. Redness will begin to foods by the third day and can easily be covered with make-up.